This was Ron Howard at his best, when he was still doing comedy, before he thought he was a serious director. Newman’s score for the film is as varied and energetic as ever, often, as in the case of this track, within the same cue. 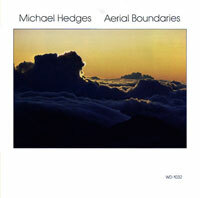 He goes from quiet subtle tones into rollicking, guitar-driven passages and then drops right back into quiescence. I haven’t seen the movie in years, so I don’t remember how this piece of music was used, but it’s the quintessential stuff of comedy. People remember this soundtrack for its hip, funky collection of tunes. Chiefly, there was the Bangles’ cover of “Hazy Shade Of Winter,” but artists from Glenn Danzig to Roy Orbison jumped into the fray. Lost in the party was Newman’s hunting, synth-driven score. 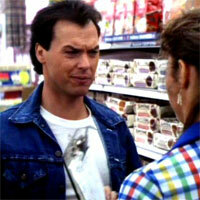 The film was, at its center, devoid of heart, a hollow, glittering shell. Somehow the music, especially this particular piece, both augments and counteracts that emptiness. 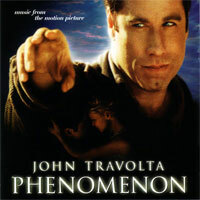 I never did see Phenomenon. And I probably never will, unless I’m in, say, a Tulsa motel one night, with the television on, the remote out of reach and unable to use my legs. Why Tulsa? Whatever, I don’t know. The score is typical of Newman’s mid-Nineties output, with plenty of double reed wind instruments, melodic strings and a Quilt-y strummed guitar. It’s mostly innocuous, but since the original soundtrack issue contained only a token Newman track, it’s a nice addition to the collection. Okay, I’m done with Newman for a while. Enjoy. I saw GUNG HO when it came out on X (it was cheap and plentiful, so I’d go grocery shopping or even clean my car on the stuff). They showed a Paula Abdul video before the film (the one with the animated cat). Neither was helped by the drug. Wow, didn’t even help? I thought almost anything could be made more tolerable with the right amount. Well, I kept getting up to wander around. That helped some, I suppose. 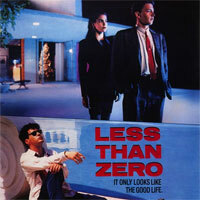 Thanks for posting the Less Than Zero track. Similar in tone to Men Don’t Leave. Someone recently asked me if I could help them find a book containing piano transcriptions of Thomas Newman’s film music – preferably a decent-sized anthology. Anyone have any suggestions of where I might find one? A quick web search turned up these two sites. I bet there are more out there… Good luck! However, I see that these are sold individually. This book is for a gift – and a bunch of loose pieces of sheet music just don’t have the same charm as a nicely bound book. So far I’ve only found books containing pieces by several composers – but I’m interested in a book containing a sort of “best of” Thomas Newman. Anyhow, I still appreciate your suggestions very much. Yeah, I noticed that, too. If you find one out there, let me know. I’d love to hear about it.